The Louet David is a one of a kind floor loom. The David is a compact eight harness floor loom available in 27 and 35 inch weaving widths. The first thing you may notice about this loom is the treadling system. As you press down the treadle on most jack looms the shafts are being raised. The David loom actually lowers the shafts as you press the treadle but this is not the only thing you will notice. Louet has constructed a spring and pulley system that makes treadling feel effortless. Inside the castle you will see 8 cams or pulleys attached to 8 springs. As you start to press down on the treadle you will feel a little bit of tension, shortly after that the cams and spring take over and bear the weight of the shafts. 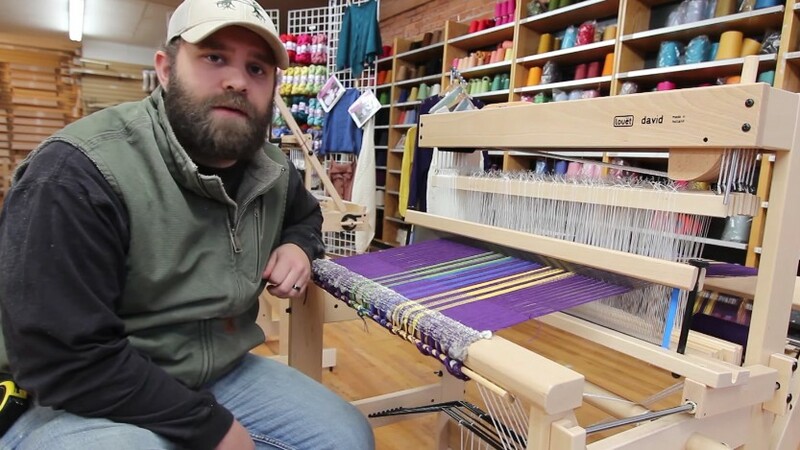 This cam system does not only make treadling easy but combined with the texsolve heddles this loom is very quiet. The David no longer comes with an overhead beater. In 2012 Louet designed a new sliding beater system with a shuttle race to replace the overhead one. This is a design that you will not find on any other loom. If you did purchase you David prior to 2012 you can replace your overhead beater with the sliding beater. The loom also features a built in raddle, metal ratcheting system and the back beam folds flat against the loom. Several accessories are also available for the David. One of the most common is the tensioned brake. The brake will allow you to control the cog and pawl on your warp beam without having to get up from weaving. This is the same system that is used on the Louet Spring loom. Louet also has a matching bench, a second warp beam and a sectional warp beam available. Overall this loom is top of the line. Its compact design take up less room but can still function like larger floor looms. You are not just buying another loom, you are buying a loom created to make weaving effortless, a quiet smooth treadle and other features that will take your weaving to the next level. So what are you waiting for? We have a knowledgeable staff and a wide variety looms. Give us a call here at Paradise Fibers and we will change the way you think about weaving.